LOVE BEING A NONNY! : January Happenings! It's cold here in North Carolina. Like 18 degrees. For some of you, that's not cold at all! But for us, it's C O L D ! We had a little snow last night. Like an inch. The anticipation of the snow is what's exciting. The news goes crazy and the stores are packed! Schools close and the kids try to build snowmen out of that little inch of snow. I made snow cream for breakfast. I learned last year that not everyone knows what snow cream is. Really???? I grew up eating it. My mom mixed snow, vanilla flavoring, sugar and milk and made it like a soft ice cream consistency! So, I scooped up some snow this morning and ate it for breakfast! I put some in the freezer for later! I am not a cold weather person so I'm trying to make the best of this weather. How many days until spring? I love wearing an apron in the kitchen! It keeps my clothes clean and when the grands are over it's so easy to wipe their hands on it. I can pick them up with dirty hands and faces without them rubbing food all over me! Plus, there are some really really cute aprons now and I love how adorable some of the patterns are! 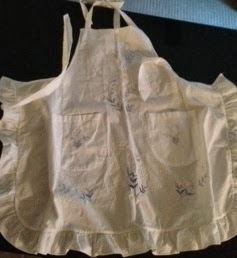 Last week my mom brought me one of her vintage aprons. I love it! 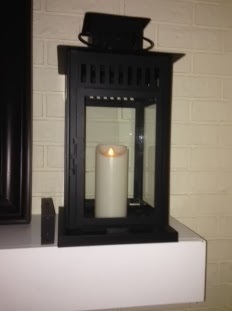 I bought some lanterns for my fireplace mantel at Ikea for a STEAL!! I decided I wanted to use battery operated candles in them so I would have the glow at night without having to worry about remembering to blow the candles out. I researched them and quickly realized that the *Luminara* brand has the most natural looking candles. I found them in a local retail store and for the height I needed, they were $70.00 each. $140.00 plus tax for two candles...Nope! So, I bought them at Bed Bath and Beyond. The brand is *Candle Impressions* and I am impressed! They were about $23.00 each and are programmable. They come on in the evenings about 5:00 and go off five hours later. One more thing, a friend shared her hot chocolate recipe on Instagram this week! It sounded so good….. I decided to make it! I brought the mix to work with me today to share and can't wait to see what the guys all think about it! I am not a hot chocolate drinker. It's not that I don't like it, I usually just drink coffee or Diet Coke. I think I will try it today too though to see if it's as good as it sounds! Here is the recipe! In a large pan on low heat, stir cocoa mix and water until melted.Add milk and beat with whisk until smooth. Heat on low until hot. Add vanilla. Serve. *For a single serving, add 2 heaping tablespoons of mix in the bottom of a mug. Pour 1/8 cup boiling water (don't measure –just add enough to cover the chocolate) and stir until the chocolate melts. Add milk to the top of your mug and add a splash of vanilla. Microwave until heated. Your photos are beautiful of your little ones! Thanks so much for this good sounding recipe. Can't wait to try it. i love to wear an apron too (keeps me from ruining clothes!). my kids gave me a beautiful one for christmas and i love it. i have been making "snow white hot choc." in the crock pot. it is really good mixed with coffee (like a white choc. mocha). its easy too! I have lanterns too, but I have used real candles. I might check into some like yours. Haven't heard of the wire less speaker you have, but I'm interested. Brrrr...cold here too. Crazy weather. Those lanterns are very cool. May need to check into those. LOVE your candles. I have seen these somewhere also but I guess the price scared me off! I will look for some and if lucky, find them on a BIG sale!! I have tons of those in the little "tea light" size. I love wearing aprons and have some old ones also! Just makes good sense wearing them!! Love the lanterns. (I am a lantern lover, just ask my daughters...). Love the battery candles. Aren't they great? And, love an apron! I am an apron gal, myself.